Solr is the popular, blazing fast open source enterprise search platform from the Apache Lucene project. Its major features include powerful full-text search, hit highlighting, faceted search, near real-time indexing, dynamic clustering, database integration, rich document (e.g., Word, PDF) handling, and geospatial search. Solr is highly reliable, scalable and fault tolerant, providing distributed indexing, replication and load-balanced querying, automated failover and recovery, centralized configuration and more. Solr powers the search and navigation features of many of the world’s largest internet sites. Solr is a standalone enterprise search server with a REST-like API. You put documents in it (called “indexing”) via XML, JSON, CSV or binary over HTTP. You query it via HTTP GET and receive XML, JSON, CSV or binary results. Client Side: this is part that is used by end user such as website, web application and mobile platform. 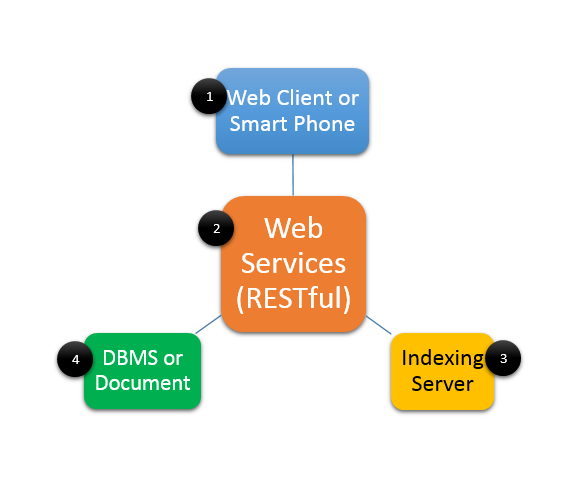 Indexing Server: this is Apache Solr for preparing all document as system file for fasting search data by using full text search. DBMS or Document: it’s a storage data such Microsoft SQL server, MySQL or any files that will show to end user. With the segment size, MyDownloader creates another request specifying the start position of the stream. In this way, we can have multi-requests for the same files running in parallel using multi-threading techniques. This technique speeds up the transfer rate even more if you are using mirrors. On previous versions of MyDownloader, the protocols support was implemented by classes that inhererited fromDownloader. This was because the previous version didn’t support Mirrors, so at the time, a single download could only come from one source. But now, with Mirrors features, we can have one piece of a download coming from HTTP and another piece coming from an FTP server. For that reason, I have refactored the code and now all supported protocols (HTTP, FTP, HTTPS) are implemented by classes that implement IProtocolProvider. 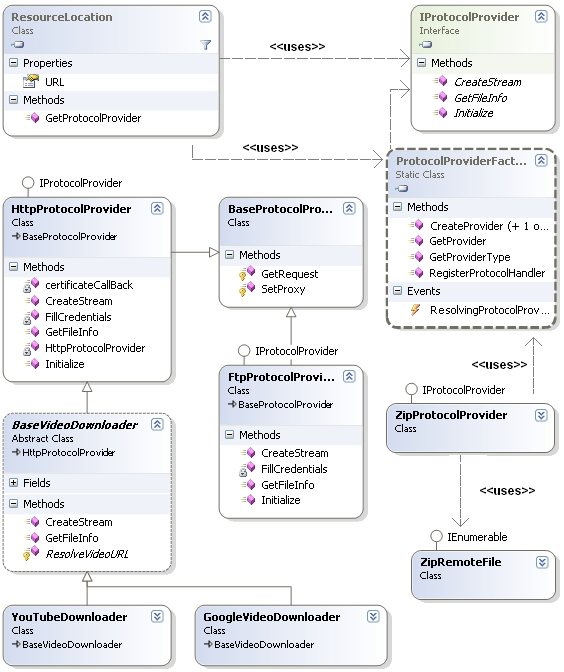 The concrete instance of IProtocolProvider is created byProtocolProviderFactory, protocols providers classes are implemented in a different class hierarchy from theDownloader class. This is done to address the restriction of using a single protocol for the download. To make it easier to retrieve the correct IProtocolProvider, the ResourceLocation class has a factory method. This method is used by the Downloader class. Many features from MyDownloader are implemented using the concept of extensibility. Because the most important classes in MyDownloader offer a lot of events, extensions can listen to those events to change the application behavior. Another nice thing is that each extension has its own settings. 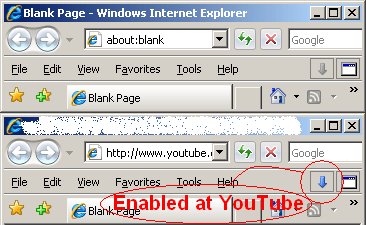 Therefore the Options dialog needs to be created based on extensions. If you open Options at design time, you will only see an empty Panel. When we think of an HTTP download, what are the settings that an HTTP downloader would require? Proxy is one of the answers. Many users are behind an HTTP proxy and connecting directly to an HTTP server is not allowed in most companies. So, to expose the settings for our HttpFtpProtocolExtension, we need to create an IUIExtension and return it through UIExtension property of IExtension. On this class we implement the method CreateSettingsView, that returns all settings that will be displayed on Options dialog. // create the Proxy user control an return it. The HttpFtpProtocolUIExtension class provides a factory method named CreateSettingsView. This creates an array of Controls that are the visualization of the extension settings. The Options dialog uses this array to populate theTreeView of options and display the setting on the right panel. Like many MyDownloader features, video downloads is just another extension. The secret is atVideoDownloadExtension and the “New Video Download” window. All URLs in MyDownloader are represented by the ResourceLocation class — this class has the method GetProtocolProvider which returns the apropriated instance of IProtocolProvider interface — the only thing that we need to do (at “New Video Download”) is to force the correct protocol provider type by setting the property ProtocolProviderType of ResourceLocation. Setting this property, when ResourceLocation class calls GetProtocolProvider, the created protocol provider will be the type stored in ProtocolProviderType, and not the provider registed on ProtocolProviderFactory. In this way we can replace the default protocol provider, and avoid that the HTML content be saved, and force to download the video from web site. After downloadeding, the video can be converted to MPEG, AVI or MP3 (audio only), this process in done using an external open source tool: ffmpeg. This tool, which is a command line tool, is called by MyDownloader with the FLV filename and conversion arguments. If you want to see details about the arguments that were send to ffmpeg, I suggest you to download the code / demo project of this article. This is another very cool feature of MyDownloder. 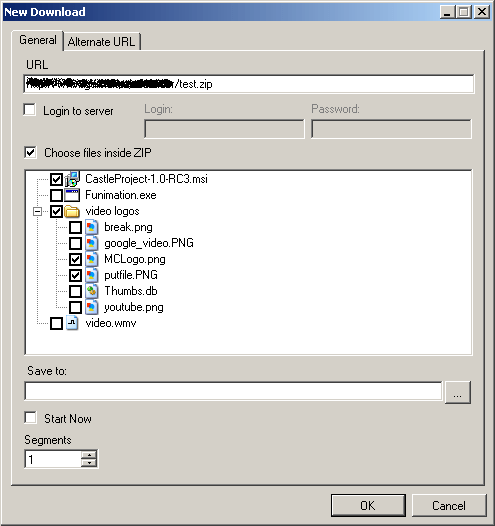 Sometimes, you need to download an big ZIP file just because you want a single file inside the ZIP, on New Download window, if user checks the option “Choose files inside ZIP”,MyDownloader will enumerate the files inside ZIP and allow user to select only that files that we want to download. The Auto-Downloads is activated (or deactivated) through the “two arrows” button in MyDownloader toolbar. When this feature is enabled, MyDownloader starts to work as a batch downloader, accomplishing each download on download queue. Other new feature of MyDownloader is “Import URLs from files” window, which allows the user to import the URLs from a text file or from an HTML file. The text files must to have one URL each line. For HTMLs, the URLs will be extracted using the same HTML parser used on Web Spider. All URLs that were found in the file will be added to the download list. 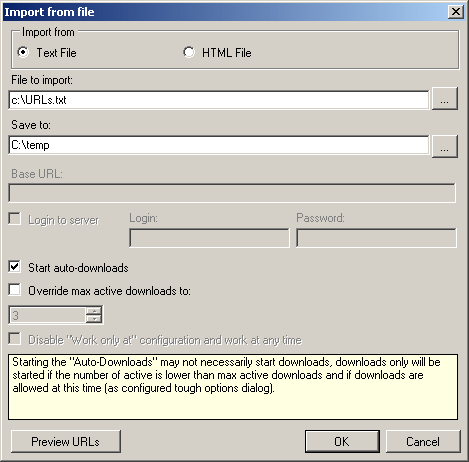 “Import URLs from files” window also have a shortcut to enable the “Auto-downloads”, and to setup the maximum number of simultaneous downloads. This kind of project is “infinite,” so below I have listed some ideas for future implementations. As any open source project, it would be very nice if you wish to contribute. I hope you enjoyed the code! If you have any questions or feedback, feel free to contact me. Solr is an advanced search coming from Apache’s Lucene project. Thanks to SolrNet, a .NET library for Solr, it is quite convenient to use Solr for search in ASP.NET. When installing Tomcat, make sure to remember the port you specify (normal for Solr is 8983). After installation, the Apache Tomcat Properties window should popup. If not, find Configure Tomcat in the start menu and make sure the web server’s started. If it’s started, you should find the default Tomcat startpage if you browse to http://localhost:8983. Before you install Solr, stop the Tomcat web server (through the Configure Tomcat window). When you’ve downloaded the Solr zip file (make sure it’s the zip version! ), unzip the archive and find the dist folder. In the dist folder, find the apache-solr-1.4.1.war file and copy it to C:\Program Files\Apache Software Foundation\Tomcat 7.0\webapps, renaming it to solr.war. Now, we also need to create the Solr folder, which will host our Solr configuration files, indexes and so on. I createdC:\Solr. You’ll also need to copy the contents of the apache-solr-1.4.1\example\solr folder to your newly created Solr folder. When you’re done, you should at least have the bin and conf folder. Now, you should first start the web server and then be able to navigate to http://localhost:8983/solr. Installation and basic configuration done! The Solr configuration files are important – you will use them to tell Solr what should be indexed and not. The most important config files are schema.xml and solrconfig.xml. These are located in the C:\Solr\conf folder. SolrNet is a great .NET library for Solr, making it all easier. Download assemblies (and samples) on the SolrNet Google Code page. I’d like to thank A. Friedman for his contribution to the Solr and ASP.NET world. Here’s his great blog post on Solr and SolrNet. Here’s some code snippets from my Solr app. You can find them in the source code, although I found it being a good idea to post code for a couple of common actions using Solr and SolrNet for search. By standard, Solr lets you index one field only, thanks to the defaultSearchField in schema.xml. It’s easy to turn on indexing of multiple fields though, using copyField and an additional field which takes multi values. Setup the fields you want to get indexed, using field. Create an additional field called “text”, setting its multiValued property to true. Use copyField to copy data to this additional field. Use this additional field, “text”, as the defaultSearchField. Turn off elevate.xml handler (comment appropriate lines in solrconfig.xml). Case sensitive configuration files – make sure you spell copyField, multiValued etc correctly. In solrconfig.xml, make sure you use matching data types to those you’ve defined in your ASP.NET app. Solr is really powerful and gives you a lot of options. I recommend the Solr Wiki for more information on what actually is possible.